H. Varmus, The Pastorian: A Legacy of Louis Pasteur. H. Okayama, A. Nagata, S. Jinno, H. Murakami, K. Tanaka, and N. Nakashima, Cell Cycle Control in Fission Yeast and Mammals: Identification of New Regulatory Mechanisms: Introduction. Life Cycle of Fission Yeast. Cell Cycle Start Control of Fission Yeast. Cell Cycle Start Control of Mammals. Mitotic Start Control of Fission Yeast. Mitotic Start Control of Mammals. Closing Remarks. References. N. Mandahl, Cytogenetics and Molecular Genetics of Bone and Soft Tissue Tumors: Introduction. Cytogenetic and Major Molecular Genetic Findings. Aberrations Shared by Several Tumor Types. Diagnosis and Prognostication Based on Genetic Analysis. References. H. Tapiovaara, R. Alitalo, and A. Vaheri, Plasminogen Activation on Tumor Cell Surface and Its Involvement in Human Leukemia: Introduction. Components of Plasminogen Activation. Activation of Plasminogen on Cell Surface. Regulators of Plasminogen Activation. Internalization of uPA. Plasminogen Activators in Tumors. Plasminogen Activators in Cell Migration. Plasminogen Activation and Leukemia. Future Aspects. References. N. Bouck, V. Stellmach, and S. Hsu, How Tumors Become Angiogenic: Introduction. Tumor Angiogenesis. Development of an Angiogenic Phenotype. Therapeutic Strategies Targeting Tumor Angiogenesis. Conclusions. References. P.L. Stern, Immunity to Human Papillomavirus-Associated Cervical Neoplasia: Introduction. Human Papillomaviruses. Immunological Recognition of HPV in Cervical Neoplasia. Evasion of Immune Surveillance. Prospects for Immune Intervention. Conclusions. References. D.J. Moss, C. Schmidt, S. Elliott, A. Suhrbier, S. Burrows, and R. Khanna, Strategies Involved in Developing an Effective Vaccine to EBV-Associated Diseases: Introduction. Host-Virus Relationships. Humoral Response to EBV Infection. CTL Response to EBV Infection. Developing a Vaccine for EBV. Vaccines and Immunotherapy for EBV-Associated Diseases. References. Subject Index. 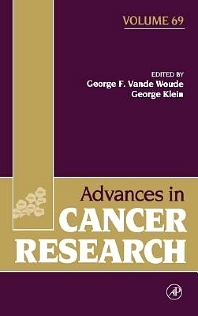 This volume of Advances in Cancer Research begins with a "Foundations in Cancer Research" articles by Harold Varmus. He focuses on Andrew Lwoff who influenced a generation of scientists and how Dr. Lwoff's influence on Howard Temlin, in particular, led to the identification of the cause of AIDS. Hiroto Okayama and colleagues discuss the conserved control mechanisms of the G1 and G2 phases in fission yeasts and mammals, and the newly identified control genes. Nilis Mandahl presents the cytogenetic findings in bone and soft tissue tumors and introduces the major molecular genetic findings. Hannel Tapiovaara dn co-workers review plasmin generation at restricted areas of the cell surface and hypothesize that it may be a catalyst for tumor cells to metastasize. Noël Bouck et al. review the evidence suggesting that certain types of stimulations of inducers by activated oncogenes, and decreased production of inhibitors of angiogenesis, may be instrumental in enabling developing tumour cells to attract new cells and continue the malignant growth. Peter L. Stern reviews the role of immunity and the prospects for immune intervention in cervical neoplasia. Lastly, Denis J. Moss and his associates discuss the Epstein-Barr virus (EBV) host-virus relationship and the immune control of EBV infections and examine development of vaccines and immunotherapy. Researchers and students in basic and clinical sciences of cancer biology and oncology, plus related areas in genetics, immunology, virology, and molecular biology.